Global Logistics News: Will US Global Trade Increasingly Move Through Gulf Ports? Global Logistics News: Will US Global Trade Increasingly Move Through Gulf Ports? Global Logistics News: Will US Global Trade Increasingly Move Through Gulf Ports? Variety of Economic, Political and Supply Chain Factors May Lead to Change in US Trade Dynamics; Rise of Third US Coast? IFor the second time in US history, a major inflection point in US global logistics may be occurring, with a substantial amount of container trade starting to move through Gulf coast ports. What may be the strongest factor in the rise of Gulf ports may be a climate where the union, environmental, and legislative obstacles to expansion and fast action may be much lower than in West coast and some East coast ports. For most of US history, East coast ports in New York and New Jersey were the dominant passageways for international freight into and out of the US. Over the last couple of decades, as the focus of US trade moved to Asian imports, West coast ports, most prominently the sister ports of Los Angeles and Long Beach in California, have usurped the leadership mantle from the New York area. In 2010, for example the combined ton equivalent units (TEU) of about 7.2 million moving through LA/Long Beach was more than two and a half times the 2.7 million TEU that was handled by New York/New Jersey. But many economic and supply chain pundits believe that ports in the Gulf of Mexico region, including Houston, Gulfport (MS), New Orleans, Mobile, and a number of smaller ports, are likely to be growing rivals to those West coast gateways, for a number of reasons. First is simply the economic and population growth of the region, especially in Texas, which continues to well outpace most of the rest of the country in both categories. In Forbes’ rankings of the fastest-growing job markets in the country, six Gulf cities made the top 50: Houston, Corpus Christi and Brownsville, in Texas; New Orleans; and Gulfport-Biloxi and Pascagoula, in Mississippi. In contrast, just one Pacific port, Anchorage, Alaska, and one small Atlantic port, Portsmouth, N.H., made the cut. California's population growth has nearly flattened, rising just 1% from 2009 to 2010, with the state seeing more people leaving California for other states than have come there, a dramatic change from the past. Even more important is the expansion of the Panama Canal, which will allow the passage to accommodate large ships carrying more than twice as much cargo as the canal supports currently. That project is on schedule and set to be complete in 2015. The Panama Maritime Authority expects container traffic to surge from 6.6 million TEUs in 2010 to 8.4 million TEUs in 2015 when the expansion is complete and continue to take market share from there. The expansion will open the Gulf to some of the megaships from Asian ports that currently primarily serve Los Angeles and Long Beach. Some analysts are predicting that more than 25% of this Asia to US container traffic will shift to Gulf and South Atlantic ports, such as Miami, after the expansion. “More of Asia will be heading to this part of the world,” Jimmy Lyons, CEO of the Alabama State Port Authority, recently told Forbes. Another important factor is the rapid growth in Latin America and South America, for which Gulf coast ports will be natural gateways to and from the US for many US imports and exports. Many countries in Latin and South America are among the world's fastest growing economies, and overall growth was 6.1% last year, much faster than most of the developed world. As evidence of this shift, in recent years Brazil has risen to become the leading trade partner at the port in Mobile, AL. Current growth rates at other Gulf ports remain strong. Of course, West coast ports will not sit idly by and watch Houston and other gateways in Gulf gain market share unchallenged. West Coast ports and the rail and truck lines serving those ports may reduce their fees to remain competitive. Anecdotal evidence suggests that is already occurring. The benefits of going through the Canal may also be offset by rising fees needed to offset the multi-billion cost of the expansion. Fees have already doubled over the past five years, from $32 per TEU in 2005 to $72 per TEU in 2010. Finally, while the Canal expansion will increase the size of ship that can be handled from about 4500 TEUs currently to 12,000 TEUs when complete, that's still not enough to handle the latest generation of megaships that now hold about 15,000 TEU, with ships on order to take that to 18,000 (although no US ports can handle a ship that size today). In part stemming from the extreme congestion seen in LA/Long Beach in the 2006 time frame, major importers such as WalMart and Home Depot have already built import DCs in the Houston area and are moving significant portions of their Asian volumes through the port there. In the end, what may be the strongest factor in the rise of Gulf ports may be a climate where the union, environmental, and legislative obstacles to expansion and fast action may be much lower than in West coast and some East coast ports. For example, economist John Husing, a leading expert on port-related issues, says regulatory climate in California makes the prospects for growing warehouse and related logistics support increasingly “impossible” there. Conversely, Gulf coast politicians on both sides of the aisle have been highly supportive of port expansion and investment, with little differences between parties. In Forbes, columnist Joel Kotkin says these political and business climate factors should not be underestimated, noting for example how Los Angeles fought fiercely to take the trade lead over San Francisco despite the latter's great natural harbor advantages. "Now history is about to repeat itself as Texas, Louisiana and other Gulf Cities seek to reorder the nation’s economic balance of power," Kotkin says. "Unless California and the Northeast awaken to the challenge, they will be increasingly supplanted by a region that seems more determined to expand their economic dominion." Will we see the idea of a "third coast" in the US start to arise? Evidence would indicate that is exactly what we are going to see. 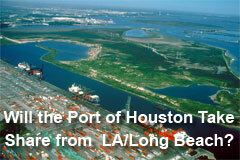 Do you expect Gulf coast ports to take market share away from other ports, especially on those on the West coast? Why or why not? Will we soon start thinking about a "third coast" in the Gulf region? Let us know your thoughts at the Feedback button below?